Great Point Properties acquired ‘Sconset Real Estate March of 2014, adding a group of talented brokers and agents to its staff while establishing a physical presence in the historic village in Nantucket’s east end. Under Great Point Properties, the ‘Sconset Real Estate office, located in the ‘Sconset Post Office building just off Main Street, will remain open year-round and will retain its current staff and name. ‘Sconset Real Estate has been a part of Coffin ‘Sconset Real Estate for decades under the ownership of Bernie and Carol Coffin. The Coffins will join the Great Point Properties staff, with Bernie remaining in Sconset and Carol transitioning to Great Point Properties’ North Beach Street office. “We are all very excited about joining a large enthusiastic group of brokers who continue to be innovative and keep up with current technology and marketing skills successfully,” Carol Coffin said. The Coffins and ‘Sconset Real Estate’s other knowledgeable sales and rental agents, including Paula McAuley, Debbie Willett and Sarah Maneikis, will be key assets on the Great Point Properties team, and were among the primary reasons for pursuing the deal, according to Great Point Properties principal Bill Liddle. ‘Sconset Real Estate is the oldest continuously operated real estate firm in Siasconset. Operated by the Coffin family since the late 1960s, the office merged with Coffin Real Estate in 1979 to become Coffin ‘Sconset Real Estate. For Great Point Properties, it is not the first time the firm has joined forces with another real estate office to offer its clients more comprehensive service. 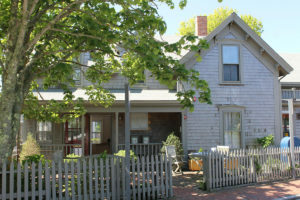 Back in 2008, Liddle and McKechnie’s Great Point Properties merged with Edward Sanford’s Sanford Real Estate and moved into the North Beach Street office where it remains today. Great Point Properties, an exclusive affiliate of Christie’s International Real Estate, is a leading Nantucket real estate firm specializing in Nantucket home sales and island vacation rentals.